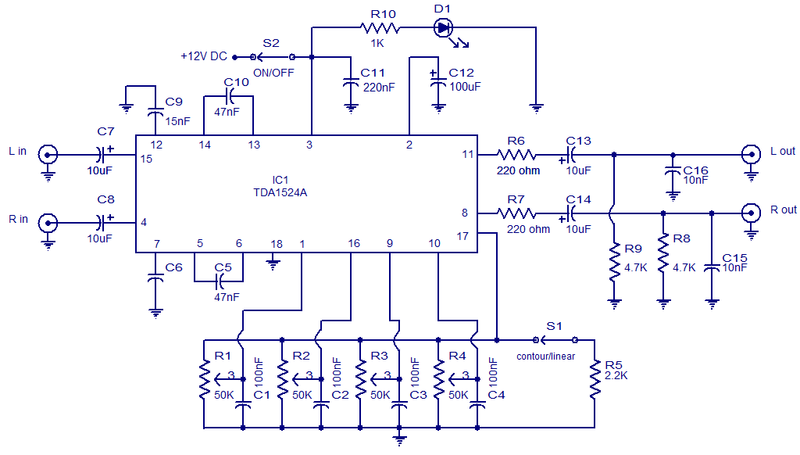 Here is the circuit diagram of an excellent stereo preamplifier with tone control using the IC TDA1524 from Phillips. The IC requires very few external components, has very low noise and has a wide power supply voltage range.Â POTs R1 to R4 can be used for controlling the volume, balance, bass and treble respectively. LED is D1 is a power ON indicator and R1o is its current limiting resistor. Switch S2 is the ON/OFF switch. Swich S1 can be used to select linear or contour mode. Supply voltage can be anything between 8 to 16V .Here I used 12V DC. On this circuit you not write capiter (C1 to C16)volt value you must be write and send me parfect circuit. can i use transformator 3 Amp…? question,do you merge the signal,control the tone,and then split the sig,again? The controls are electronic controls each control will operate for both channels in tandem. Hi Vinu to avoid 1 pot for balance control R2 you have to use 2pots in the input to control the volume. more component count? This is a good circuit. And i want to make this. But i don’t want the balance control . So how can i avoid that pot ?. I know that all i have to connect the in and out without the pot, but the 100nF cap is confusing me. Which the ic use for this pre amp.? I am grade 10 student. 47nf polyester’ku pathila etha paavikkalam. Plz.!! Hi Anil I have assembled this way back in early 90s a nice circuit with very good quality and control range, with Philips application 40 watt circuit. This circuit is with single supply, hence you can use with single supply power amplifier. motional feed back amplifier is most suited for this chip. Do not try to use this dual supply power amplifiers you will end up with heavy distortion of reproduced sound. is this circuit is tested by anyone?????? It is working properly???? Hi Kristijan R1 is volume, R2 is Balance, R3 is Bass control and R4 is treble control. Hi admin, can you help me finding or combining the schematic of CREATIVE subwoofer which consists of ICs (TDA8510J and MC4558CN) I’m interested in its sound and BASS ,please help. seethraman told me to short R9 & R10 i shorted,temperature of transistors decreased but Q7 is getting hotter than Q5 why ? Where is going the other end of S2?And what is the value of C11 and C12(and voltage) capacitors? What is the value of capacitors C11 and C12? it was not mentioned in the circuit diagram.